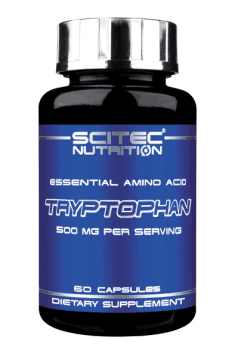 Scitec Tryptophan is a dietary supplement in the form of gel capsules which contains tryptophan, i.e. one of the indispensable amino acids. The formulation improves sleep quality and helps regulate the circadian rhythm. However, its range of uses is much broader. L-Tryptophan is an indispensable amino acid which cannot be synthesised in the body. Consequently, it is necessary to provide it with food or supplements. The amino acid is a precursor to serotonin whose role is to regulate our mood and appetite and its deficiency may lead to depression. Because of that, L-tryptophan is used during very tense situations to reduce stress and promote well-being. It is recommended to women to relieve symptoms of premenstrual syndrome and support lactation in breast-feeding mothers. L-Tryptophan is also involved in carbohydrate metabolism and curbs appetite, thereby promoting body fat reduction. Maintaining adequate tryptophan levels to promote normal serotonin levels, which stabilise our mood, depend on the dietary intake of this amino acid and a decrease in its serum levels after protein synthesis. Interestingly, even though tryptophan is required for many metabolic pathways, it has the lowest concentrations in the body compared to other amino acids. L-Tryptophan competes with many other amino acids found in food to cross the blood-brain barrier. Eating food that is lower in protein and higher in carbohydrates increases tryptophan’s chances of entering the central nervous system. These nutrients are interconnected because saccharides promote the transport of tryptophan into the brain. Carbohydrates induce the release of insulin which inhibits the penetration of other amino acids into the brain and that is why tryptophan gets priority over them. In the brain, tryptophan is converted by tryptophan hydroxylase, leading to the formation of serotonin – a very important neurotransmitter. It is converted in turn into melatonin that is a hormone which regulates the circadian rhythm of our body. Interestingly, according to numerous studies, women are much more sensitive to a decrease in serum tryptophan levels. As a consequence, they have much more mood swings than men. The amount of tryptophan entering the central nervous system depends from the amount provided to the body (in case of some amino acids, like e.g. L-tyrosine, it is equal to its requirement). The higher tryptophan levels are, the more neurotransmitters are produced, such as dopamine, noradrenaline and beta-endorphin. Since L-tryptophan is highly active in the nervous system, supplementing with this amino acid is recommended especially to inviduals exposed to chronic stress and/or constant mental overload and those who have problems with falling asleep. It is also indicated when we feel that our motivation wanes due to dejection and anxiety. In addition, l-tryptophan is a supplement recommended to women to relieve PMS symptoms. The amino acid is used by the body to produce niacin (otherwise known as vitamin B3 and PP and nicotinic acid) which is particularly important for normal function of the brain and peripheral nervous system. Tryptophan takes part in the synthesis of kynurenine. i.e. a UV filter produced in the eye. This is crucial especially to the elderly in whom tryptophan supplementation is required for preventing cataracta. Incorporating L-tryptophan into a diet may be beneficial to breast-feeding women because it may promote lactation. Tryptophan is found in mother’s milk (at highest levels during the night). Because of that, it soothes the baby and thus helps it fall asleep. In the infancy, the requirement of tryptophan per kg of body weight is the highest (about 13 mg). Nonetheless, you should consult your physician before taking tryptophan. To sum up, Scitec Tryptophan is a dietary supplement which promotes general well-being and may therefore prevent depression and increase your motivation. It should be taken when you have problems with falling asleep or to improve the quality of your night-time rest and recovery. It is suggested both for athletes who put a strain on their nervous system during heavy workouts and non-training individuals who need support due to chronic stress. The supplement is also useful for women before and during menstruation.